Of course, you love spending time in your pool. Who wouldn’t? But how much do you enjoy spending time having to clean it? Cleaning your pool doesn’t need to be such a chore. And there are ways to cut down on the time it takes. Just a few minutes a day, and another half an hour or so a week should be all that’s needed! The thing to bear in mind, first and foremost, is that it takes a lost less time to prevent problems from occurring than it does to clean them up and sort them out once they’ve occurred. Problems like algae or cloudy water can take a long time to fix, but only a few minutes of regular cleaning to prevent. The other thing to remember is that healthy pool water, with a proper chemical balance, and regular filtration, requires an awful lot less cleaning than pool water that’s been allowed to get out of balance or insufficiently filtered. So here’s a time saving guide for how and when to clean your pool. If you follow these tips, you’ll be able to spend more time in, and less time on, your pool. Make sure that, during the swimming season, your pump and filter system is running for at least 6 hours in any 24 hour period. Don’t run it for 6 hours straight. Get a timer for you system and set it to run at 2 hour intervals – with at least one of those at night. Not only are nighttime electrical tariffs cheaper, it’s a more effective time to introduce and circulate pool chemicals. The great thing about this tip is that it doesn’t take any time out of your day. It’s automatic. It only takes a couple of minutes a day, but skimming the surface to remove leaves, bugs, pollen etc. gets a lot of stuff out of your pool before it can do any damage. Most debris that enters a pool floats for 3-4 hours before sinking to the bottom. If you skim it out before it sinks, you won’t have to vacuum it out later. What’s more, this natural debris brings with it all the nutrients necessary for algae to thrive. 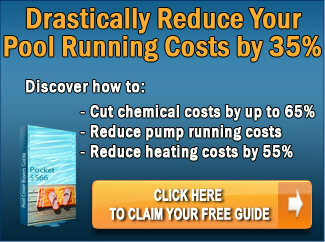 And the longer it remains in your pool, the more it decomposes – and the more it depletes the pool’s free chlorine. And the less chlorine there is, the greater the potential for algae growth. As an alternative to daily skimming, you might want to consider investing in swimming pool blanket or even a Solar Breeze Pool Skimmer – a solar-powered, robotic surface skimmer that removes 90-95% of surface debris. It’s cordless and operates independently. Again, it only takes a minute or two, but, for the same reasons as above, empty the skimmer basket everyday. Dispose of surface debris and skimmer basket contents well away from the pool so they’re not blown back in. During the summer, check and adjust the chemical balance twice a week. The healthier the balance, the less you’re going to have to waste your time cleaning the pool. 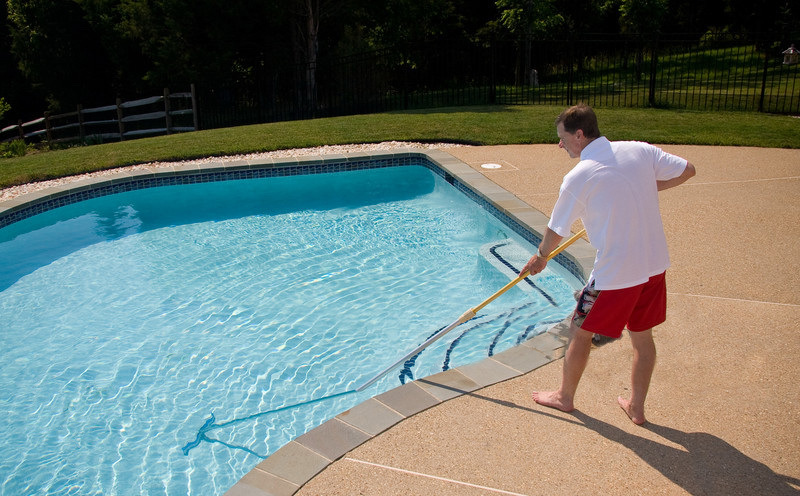 Regular brushing of the pool walls, tile-line at the water surface, steps, ladders, and slack-water corners keeps the pool water healthy and prevents the growth of algae. If you do this once a week it should only take 5-10 minutes to brush down an average backyard pool. After all, it’s not as if you’re being asked to scrape barnacles off the hull of a battleship. But, if you don’t do it regularly, it might start to feel like you are! Fair enough. This is the one bit of pool cleaning that can’t be hurried. It needs to be done once a week, and when you vacuum, you need to do it slowly, deliberately, and methodically. If you try and rush it all you end up doing is stirring up the debris so that it doesn’t get sucked up, or missing bits. As a result, an average backyard pool can take around 30 minutes to vacuum. On top of that, if you’ve got a sand or DE filter, there’s the time-consuming need to backwash, clean the pump filter basket etc. When you’re priming the hose to your vacuum hose (i.e. flooding it with water to remove trapped air that may otherwise be drawn into the pump and create an air block), don’t just hold it under water – hold the end of the hose over the pool’s return port. The water shooting out of the return port will quickly expel the trapped air. Consider switching to a Cartridge Filter system. Unlike sand or DE filters, with cartridge filter systems there is no need to backwash. 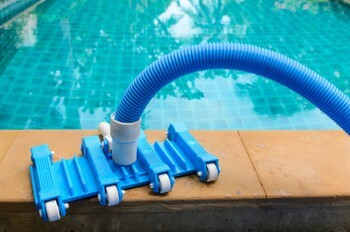 Consider investing in a robotic pool cleaner. A robotic cleaner does the vacuuming for you! And they operate entirely independently of your filter system. For more information, Click Here. 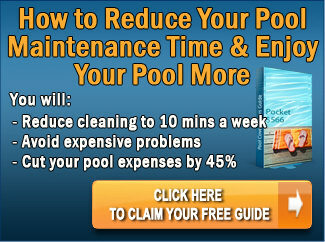 Without any doubt at all, a pool cover is the number 1 time saver when it comes to pool cleaning. 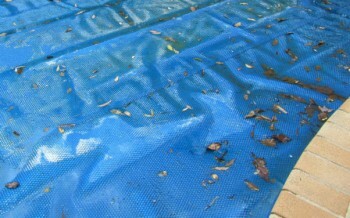 That’s because pool covers prevent leaves, debris, bugs, etc. from entering the pool in the first place – so there’s much less to clean up. A pool cover will reduce the need for cleaning and vacuuming by between 50-70%.